Saturday nights are usually all about take out for us. Between my daughter’s gymnastics running right up to dinner time and college football being on, we rarely want to go out and I don’t want to cook anything elaborate. But, as we near the holidays, we are also trying to limit eating out so much since it gets expensive. 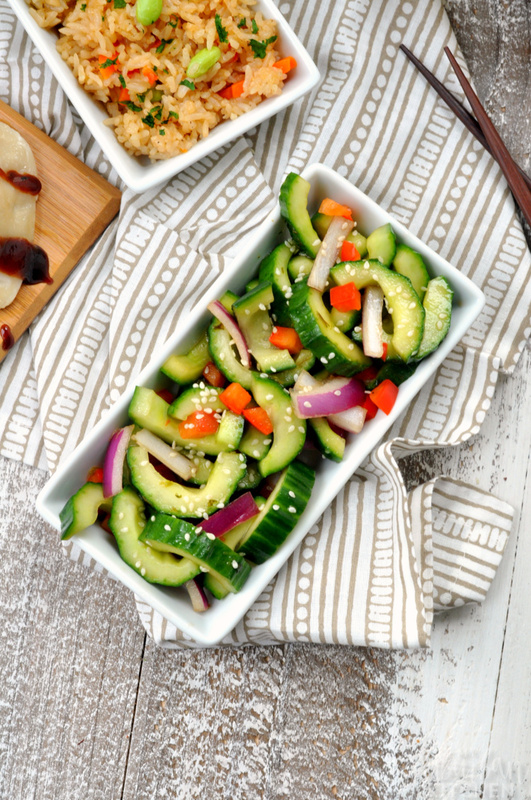 So, instead, I’ve been creating take-out style meals at home like this Asian cucumber salad. 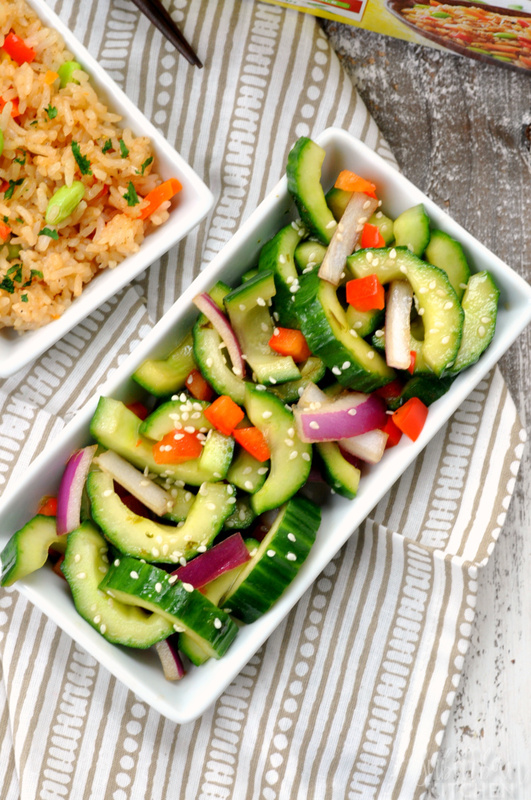 We pair this Asian cucumber salad with Ling Ling Fried Rice and Ling Ling Dumplings for the perfect take-out replacement. All together, the entire meal takes less than 15 minutes to make and tastes just like we ordered it from our favorite restaurant. 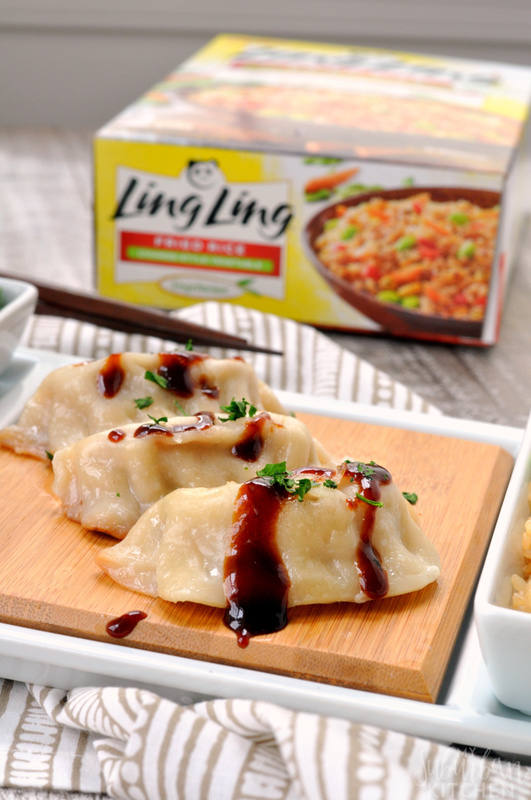 The amazing, restaurant quality tastes comes for Ling Ling’s Infusion Cooking which means each grain of rice and noodle is infused with Ling Ling signature sauces for incredible flavor in every bite. The Ling Ling Fried Rice comes in five unique versions including Yakitori Chicken, Yakiniku Beef, Thai-style Chicken, Chinese-style Vegetable and Bibimbap Beef. There are also Asian Noodles and Steamed Dumplings. The dumplings come with a delicious dipping sauce. 1. 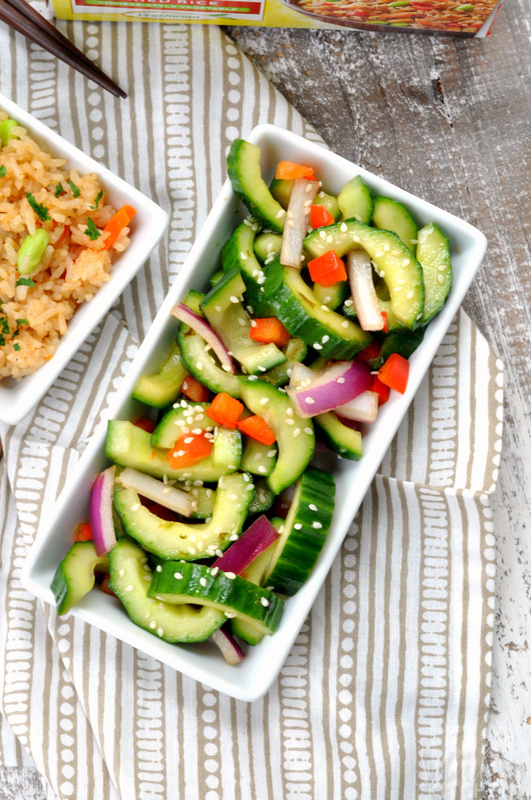 Slice cucumber in half and then slice lengthwise. Combine with bell pepper and red onion in medium bowl. 2. In a small bowl, whisk together rice vinegar, soy sauce, honey, garlic, ginger and sesame oil. 3. Add dressing to cucumber mixture and toss to combine. Top with sesame seeds. 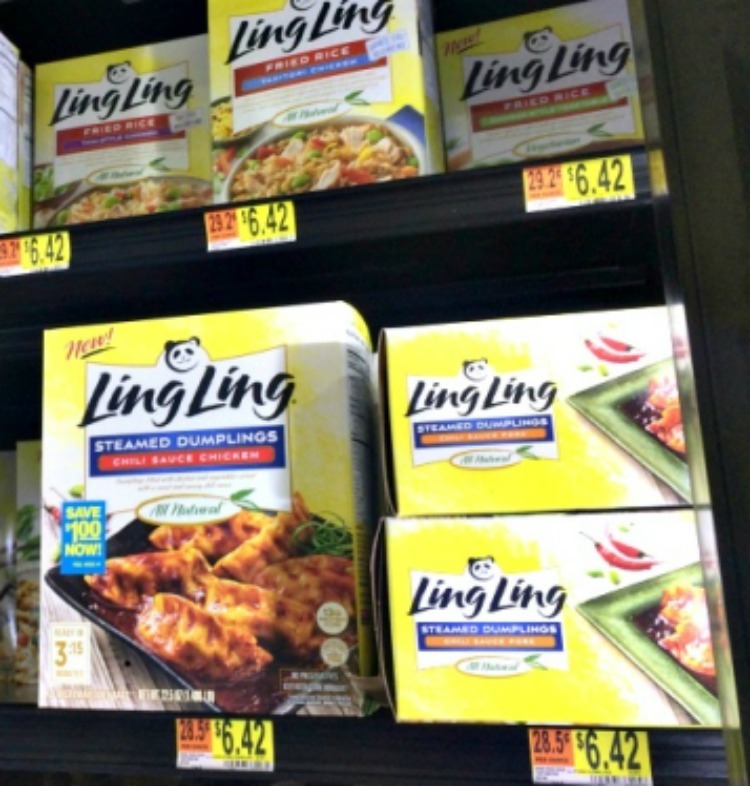 You can find Ling Ling Fried Rice and Asian entrees in your local Walmart frozen food section. 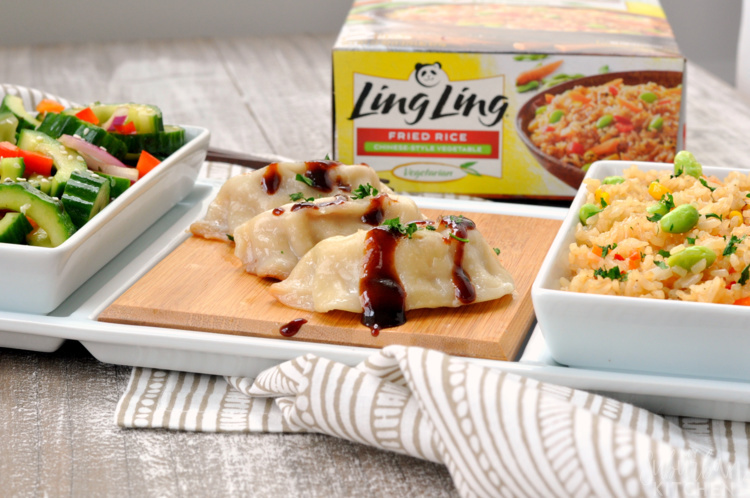 Before you shop, grab this coupon for $2 off one box of Ling Ling Fried Rice, Noodles or Dumplings. 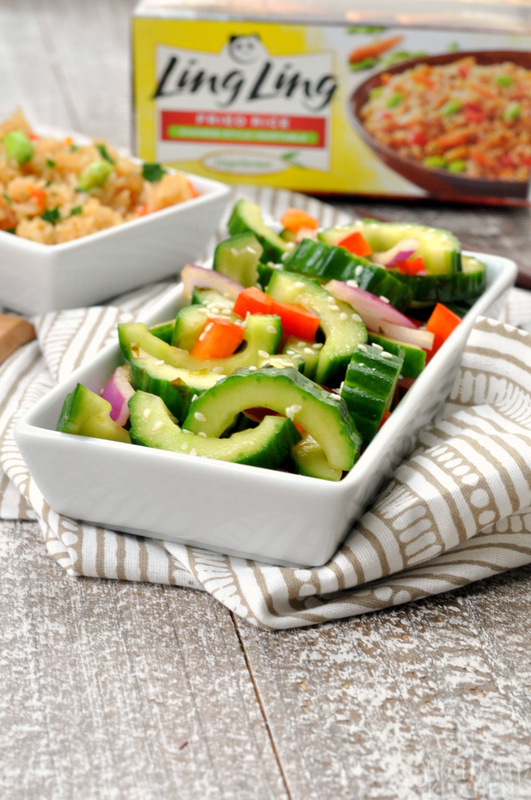 And, be sure to pick up the ingredients for this Asian cucumber salad to help complete you meal while you are there! This recipe is perfect for weekdays when I do not have much time to prepare dinner. It’s easy and quick allowing me to serve my family good food. Thank you so much for sharing this brilliant recipe. You’re a life saver.